There are lots of materials which could be used in the building of a garage door. What's more, if you don't find a ready-made garage door specifically to your liking, you can even arrange a custom-made one. Wood is a popular choice when the door is made specifically for a particular property, but ready-made ones are available too. Because wood is a poor conductor of electricity, it can make a great choice for a garage door - it'll never get too cold or hot. If you've decided that a wooden garage door is right for you, here are some tips for taking care of it! This is a basic form of garage door maintenance. When you paint your wooden garage door, you can style it in the way you want, rejuvenate the way it looks if not new, and make it water resistant all at the same time. You'll just want to make sure that any paint you opt for is designed for wood and exterior use. Water can only penetrate through the paint if it stays there for a long time - that's why you should try and recoat your garage door at least every two years. After all, chipped paint does not look that good - you'll naturally want to do something about it! We always advise customers to leave a ventilation space in their garage to help the air continue to circulate. We can help install one if you don't currently have a space for this - we'll do it the right way to avoid damaging your door. Depending on the kind of wood you've chosen, you may have a few cracks that pop up from time to time. These can be caused by a number of factors but you'll want to treat them as soon as possible just in case minor damage gets larger and spreads. 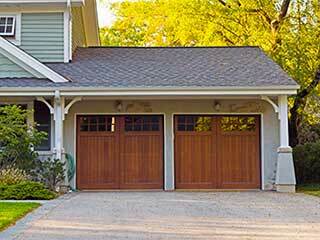 Further questions regarding your wooden garage door and how best to look after it? Contact our team at Garage Door Lakeworth in Florida for professional advice you know you can trust.